Trip reports, sports road trip ideas, and sports opinions from a guy who lives for one thing: sports travel! With the NCAA baseball season in full swing, I've volunteered to do a few college ballpark reviews for Stadium Journey while I still can. Weekday afternoon games are ideal, as they get me out of the house and to some places that I'd not visit otherwise without angering my wife. 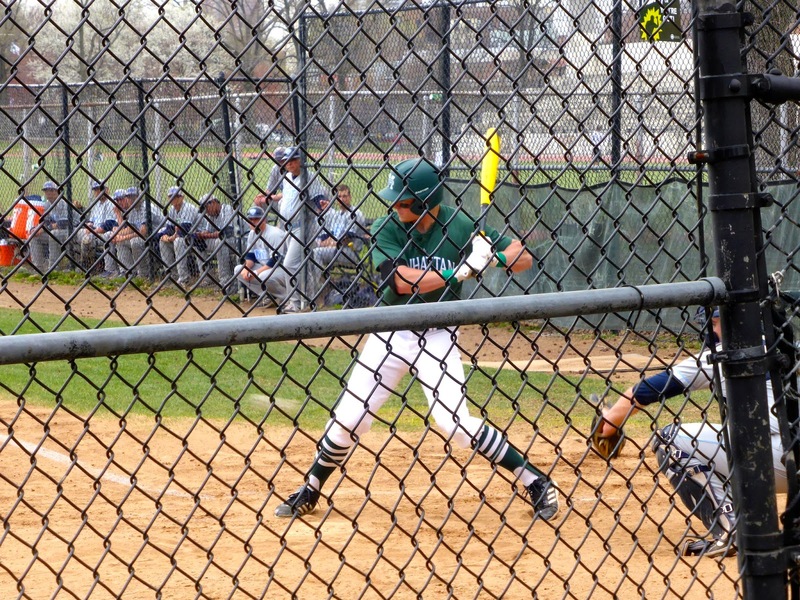 Today was such as case, as I took the 1 train all the way to the final stop, 242nd Street, where the Manhattan Jaspers play ball at Van Cortlandt Park. I didn't expect much as the Jaspers are a team of which few New Yorkers are aware. When the college first opened in 1853, it was located on the island of Manhattan, but it moved to the Bronx in 1922 without changing its name, leading to nearly a century of confusion. 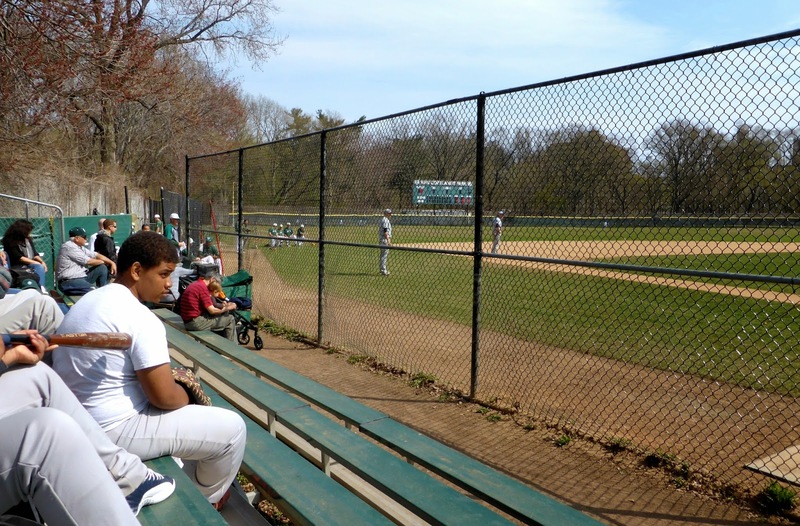 The ballpark (and ballpark is a word that is used very loosely) is really a public diamond that the Jaspers (named for Brother Jasper, the school's first athletic director) use on occasion. It is right next to the final stop on the 1 train at 242nd Street. That's it below. Yes, that is an NCAA Division I baseball stadium. As I approached, I thought I was in the wrong place, until I saw the players warming up and heard music blaring. 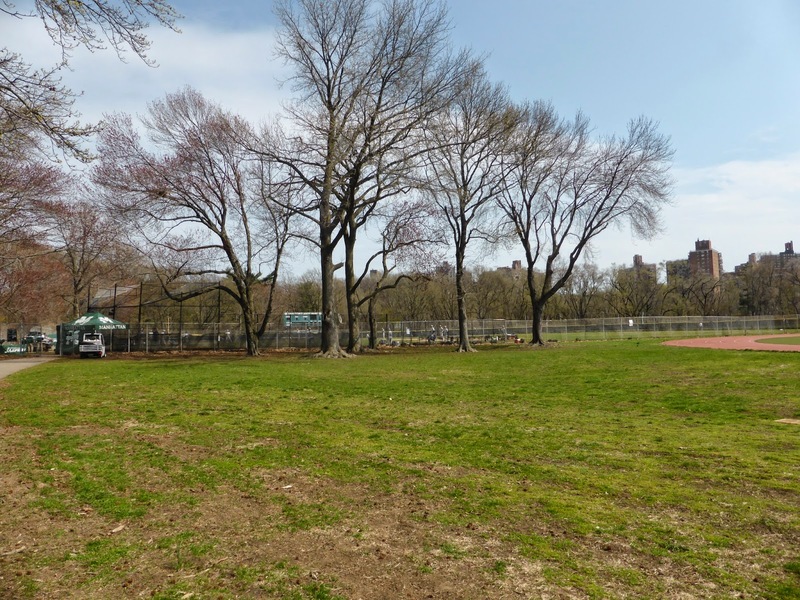 There are no tickets, just a single set of benches, with the view of the field blocked by a chain link fence. Reminded me of my teenage years when we played pick up games at similar diamonds. 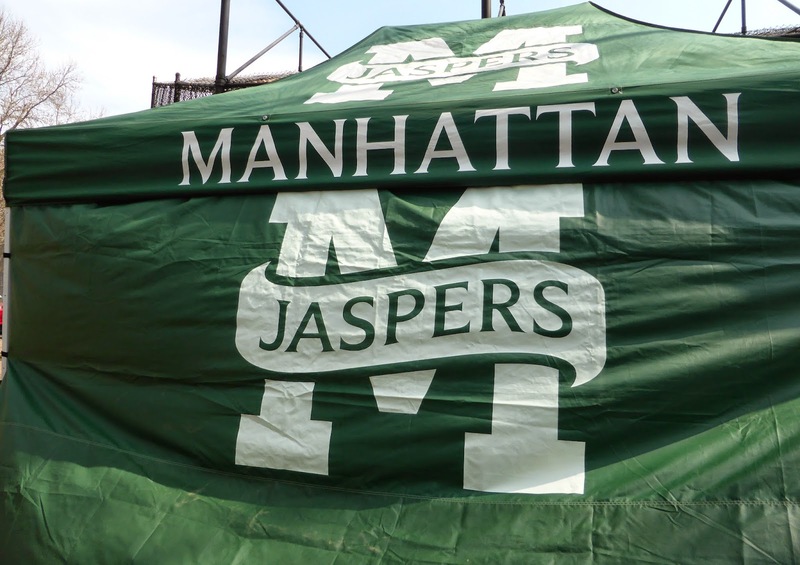 The Jaspers were hosting NYIT, who had the distinction of being the worst team in Division I, coming in at 1-33 (that's .029 in win percentage). There's 296 teams in Division I and Manhattan wasn't much better at 8-26, good for 287th in the land. Not surprisingly, no ESPN coverage for this one. The visiting Bears scored singletons in the first and third and then exploded for 4 more in the fourth behind three sacrifice bunts and a whole bunch of fielding miscues from Manhattan. That was more than enough for NYIT starter Tommy Cardona, who pitched a 5-hit shutout while his mates tacked on 7 more runs for a 13-0 shellacking. When you lose by that much to the worst team in the country, you are now the worst team in the country! Congratulations Manhattan! Attendance was announced at 114, but they must include the players and umpires, because I counted only 36 fans. Then again, I left after five innings as it started raining and I had to get to the Mets game, so maybe another 80 people showed up for the final four frames. I doubt it though. Manhattan may not be famous as a college, but it is the answer to a couple of interesting baseball trivia questions. The Baseball Hall of Fame credits the college with inventing the seventh-inning stretch, but this appears to be an urban legend. More verifiable is the fact that the first Latin American born player in Major League Baseball, Luis Castro, was a Manhattan College alumnus before joining the Philadelphia Athletics in 1902. He's dead now, thus spared the embarrassment of this game. With the rain falling, I made my way back to the subway and took the 1 train to Times Square where I switched to the 7 express to get out to Citi Field. The whole trip took just over an hour, and by the time I arrived, the rain had stopped. Don't be fooled by the picture below though, that was taken on Sunday afternoon; it was still cloudy last night and it continued to rain off and on throughout the game. The Mets were hosting Adam Wainwright and the NL champion Cardinals in what I expected to be a fast-paced affair. 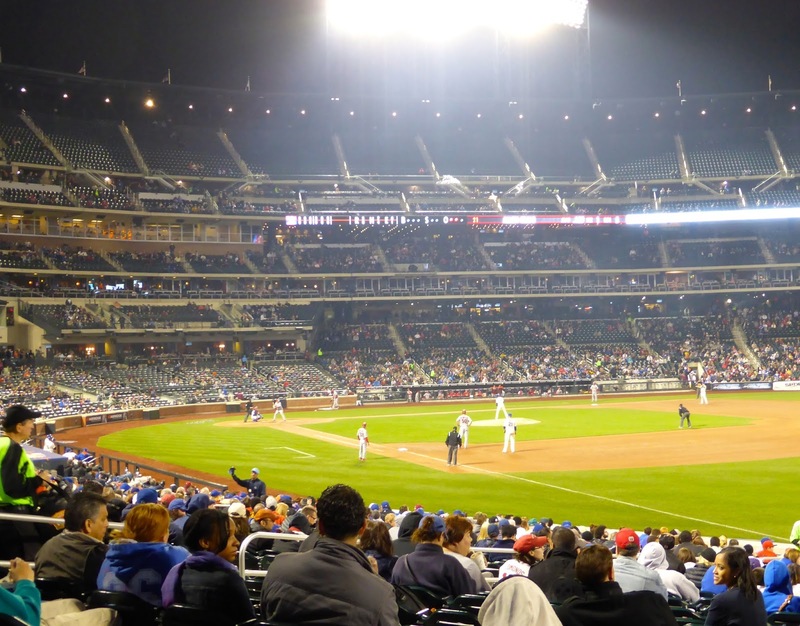 When I first visited Citi Field back in 2009, I was not impressed. 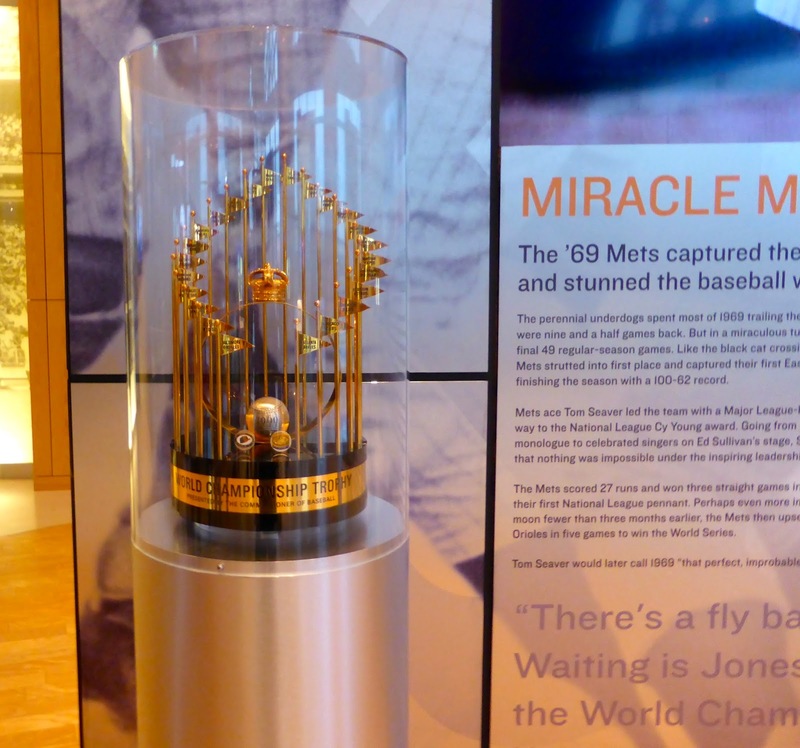 But things have changed since then and the park is much brighter now and has more attractions, most notably the Mets Hall of Fame and Museum which includes the World Series Trophies (1969 below). 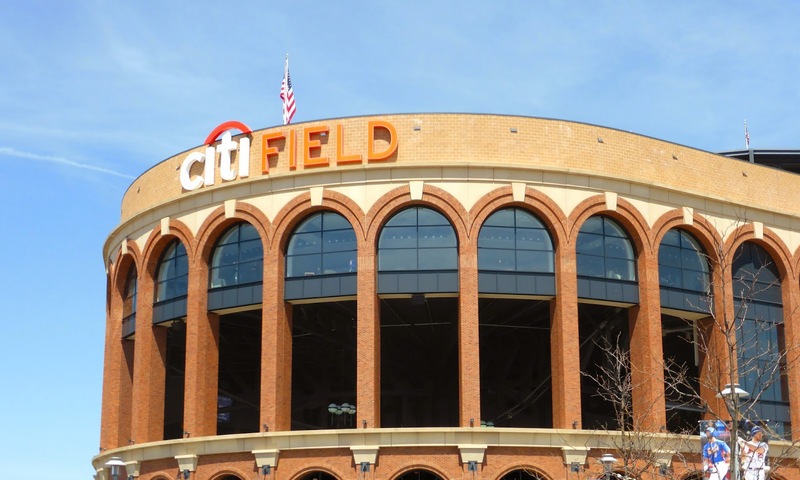 Another change is that the Mets, along with 26 other MLB teams, have an arrangement with StubHub. There are a couple of disadvantages of this partnership: tickets can be no cheaper than $6 and listings disappear from the site 2 hours before the scheduled start of the game. Yet, there are some advantages too. While attending the college game, I was still able to find a lower level seat for $8 (view from my seat below). This is a bargain to see one of the best pitchers in the game. However, I did not have a printer with me, so I tried to get in using the barcode on my phone. This didn't work, so I was told to get my ticket printed at the ticket office, where a friendly lady took my phone and ID, confirmed all was on the up-and-up, and printed a normal stub for me. This is great, as real stubs are so much better than paper tickets as souvenirs. I took some time to tour the park and as mentioned, found it to be a significant improvement over my first visit. The game was excellent as well, played at a fast pace from start to finish, with the PPM coming in at 1.65. Wainwright was as good as advertised, needing just 79 pitches through 7 innings while keeping the Mets off the scoreboard. Unfortunately, he suffered a hyper-extended knee trying to field a chopper in the bottom of the 7th and was removed from the game. Kevin Siegrist and Trevor Rosenthal each pitched a single inning to maintain that shutout that otherwise would have belonged to Wainwright as the Cardinals won 3-0, with John Jay's 4th inning two-run single the big play. Dillon Gee took the hard-luck loss. 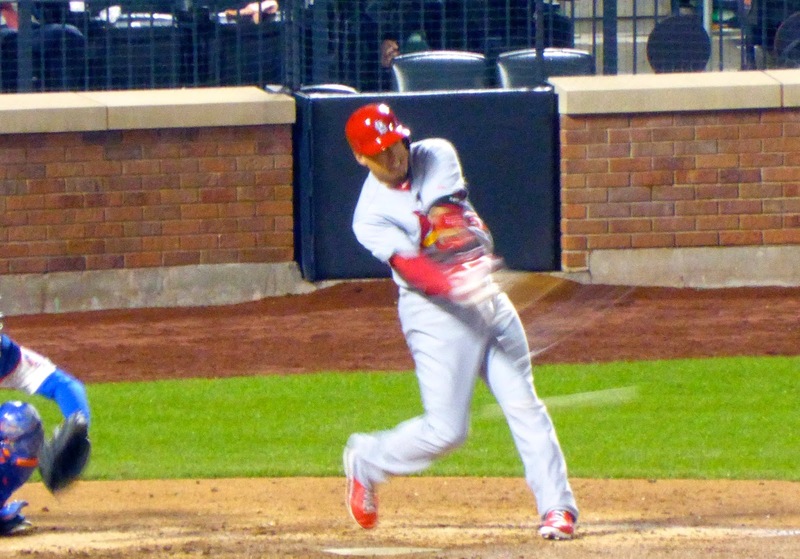 That's Allen Craig swinging and missing below. In the self-indulgent fact section, there have been six 3-0 contests in MLB in 2014 and I have attended three of them.